Purchased approximately 1998, Perth WA, from Roberta van Maanen, 'Old Glory Quilts'. It is not used. 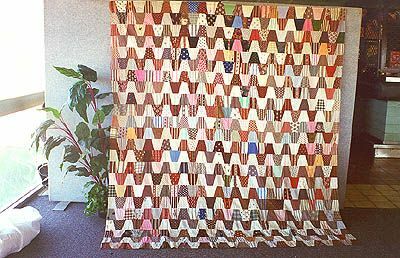 Patchwork quilt, machine construction in pink and white twill cotton, log cabin pattern. Each log cabin block was constructed with the backing in place, in groups of 4 blocks placed together. Each block 200mm in size. Quilt of over 6000 suffolk puffs (also called yo yos) in a mix of cotton and synthetic materials. The top is hand stitched on to a satin backing. Yellow and white cotton Durham quilt with centre panel of patchwork blocks in counterchange design called 'Plate'. There is a wide yellow border and square white corner blocks. It is padded and there is a yellow backing. 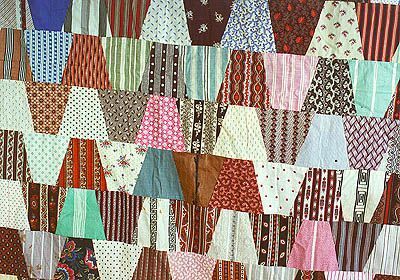 It is quilted all over following the patchwork pattern in the centre panel. Feather pattern border. Single bed quilt hand pieced from silk hexagons using the English method. The border, backing and central rosette of hexagons are black. All other hexagons are a mixture of plain colours, stripes and florals. They are randomly placed. It is quilted in a diamond pattern. The padding is a thin cotton woven material. Double sided patchwork quilt/rug constructed from squares machined together in strips and then the strips joined. The squares average about 27cms. The materials are mainly woollens, fleck tweed, school jumpers, gren check, and chenille and all are from used clothing. Double sided quilt with both sides based on a central frame. One side has centre panel of darks surrounding 4 patch of the same print in different colourways. This is surrounded by borders of rectanglesis small prints, checks and stripes. The outer border is men's suitings. The other side has a centre frame similar to the 'Broken Dushes' pattern surrounded by wide borders in solid colours, paisley and fine checks. There is a dark strip across the top and bottom. It is roughly machine quilted.